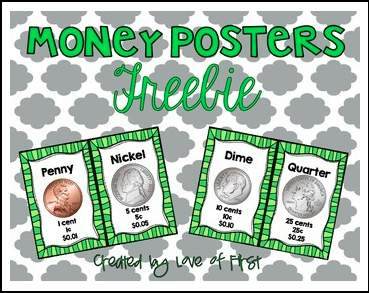 These posters show a penny, nickel, dime, and quarter with the word, picture, and various versions of the value. Two options are included--colorful or printer friendly version! Print these out and display in your classroom to help your students with coin recognition and counting. Enjoy this FREEBIE and don't forget to check out my Money, Money, Money Pack which includes 5 fun games including I have, Who has, Task Cards (Scoot), and MORE!